Below is an interview conducted by Cheryl Morgan of Salon Futura fame. She's interviewing Gary K. Wolfe who some readers may recognize as the American half of the Coode Street Podcast, the other being Jonathan Strahan. The video runs to about 35 minutes and has some interesting points and observations to make about reviewing. I found the discussion toward the end where Cheryl and Gary talk about publishers and the pressure placed on reviewers to review to a set timetable revealing. I agree with Gary too when he says it doesn't take long for the novelty of a free book to wear off. The interview was promoted at Salon Futura Issue 6 worth checking out if you are a SpecFic fan. Interview with Gary K. Wolfe from Cheryl Morgan on Vimeo. Did you enjoy this post? Would you like to read more? You can subscribe to the blog through a reader or Follow me on twitter. One of my favourite thriller writers is Barry Eisler, he is infinitely better in my opinion than Lustbader, Clancy, Cussler or Childs. Fast paced gritty action that is about as psychologically real as it can get, especially when it comes to the description of combat. Did I mention he's a New York Times' best seller as well. Which is what makes news of his decision to self publish a short story quite significant. Eisler has self published a short story called The Lost Coast featuring the character Larison from his previous novel Inside Out . The file includes teaser chapters from his next book and to make things a little more interesting Larison, an anti hero in Inside Out , is gay. So Eisler appears to be pushing more than one boundary in this experiment. For Larison, a man off the grid and on the run, the sleepy northern California town of Arcata, gateway to the state's fabled Lost Coast, seems like a perfect place to disappear for a while. But Arcata isn't nearly as sleepy as it seems, and when three locals decide Larison would make a perfect target for their twisted sport, Larison exacts a lifetime of vengeance in one explosive evening. Well it's early days yet, but Joe Konrath the Self Publishing maestro, reports it rocketing up the kindle best selling lists. With only a handful of reviews on Amazon though, it's probably down to Eisler's well known brand. Warning: this story is intended for mature audiences, and contains depictions of sexual activity, though perhaps not in the way you're expecting. I suspect this is to warn the insecure among the readership that it features some homosexual sexual activity. It can be purchased through Amazon, Smashwords or Barnes & Noble. Which would seem to me to be the best way to go; to make the work available to as many of his fans as possible. Note there appear to be no geo-restrictions on this product either. 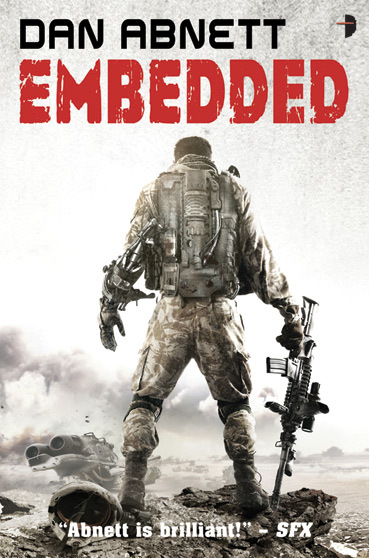 Embedded is realeased worldwide in April of this year. The Robot Overlords at Angry Robot Books have supplied an ARC for my perusal. Dan Abnett is well known within gaming and comics subcultures. Abnett worked for some years on the iconic 2000AD comic from whence the Judge Dread character originates. He also worked for Marvel on several lines including The Punisher and X-Men. He is also the evil genius behind some of Games Workshops/Black Library's best selling and most highly acclaimed Warhammer 40K game tie ins. Fans of Doctor Who and Torchwood may know him from his, novels Border Princes, The Story of Martha and his writing for the big finish audio series. So with that much popculture cred under his belt we'd be expecting something fairly spectacular from Abnett. What we get is a well realised background and military science fiction that is most definitely a post "war on terror" novel. Lex Falk is a reporter on the slow downward spiral of his career. Though he still has enough cred and nouse to play the game, life and long haul space flights is taking its toll. He lands on Eighty-Six, (settlement worlds are numbered for some time before they are named) the commission is cushy and having him there reporting grants the Settlement Office's (SO) operations and media strategy credibility in dealing with the "dispute" that is affecting corporate share prices. It soon becomes apparent that what the SO is presenting as "dispute" is something more. Falk teams up with some old contacts and a corporate trouble shooter to try and dig up some more information. This involves Falk being embedded into the consciousness of an enlisted soldier and as you might guess the ride from there on isn't a piece of cake. The "world" of Embedded is nicely realized and I detect some subtle comments, or perhaps observations on current world affairs in regard to corporatisation and military action. The language used by the Settlement Office Military Directorate (SOMD) is reminiscent of the Bush Administration's sanitizing of the term 'torture' ie enhanced interrogation. The book is certainly post September 11 fiction. I had a nice chuckle at the idea of a corporation sponsoring a swearword that is linked to one of their beverages it was Freeking® brilliant. It's not 'ard science fiction, there's hat tips to it though, with spinrad drivers for 'in system' travel and health problems caused by low gravity, but its light on detail for how live communication works across the vastness of space. Mind you I don't think it pretends to be either, it's gritty military science fiction. I felt the reveal at the end came a little too late in the book, I wanted a bit more story about the mining discovery that the forces are fighting over. I suspect though, that there might be a second book in the works. A couple of fight descriptions we a tad over done. They were gratuitous and disrupted the flow of the action, dropping me out of the story. I think Abnett might have been having a bit too much fun with them. Borders Selling Second hand books as new? The collapse of REDGroup has sparked a number of news reports, some gloating from News Corp, a lament from Richard Flanagan at the age. It was this post from Australian author Kirstyn McDermott that caught my eye, both for its consider comment and a rather peculiar revelation - what appears to be a secondhand book being sold for full price at a Borders store in Melbourne. 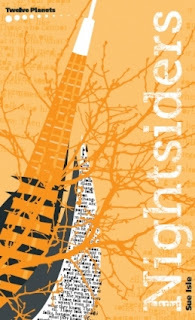 Nightsiders will be released in March 2011. Did you find this post useful? Would you like to read more? You can subscribe to the blog through a reader or Follow me on twitter for instantaneous book news. Colour me a bit surprised on this one. I was aware that Borders in the US had filed a chapter 11 for bankruptcy but I thought that REDGroup Retail who own Borders Australia, Angus & Robertson and New Zealand's Whitcoulls were a different company or at least financially separate. A day after US book store Borders collapsed, local chains Borders, Angus & Robertson and the Whitcoulls group of newsagencies in New Zealand have been placed into administration by owners REDgroup Retail. It is understood the board had serious concerns about the solvency of the company and was forced to call in administrators Ferrier Hodgson this afternoon. The ABC also understands that a combination of the high Australian dollar, cheap books online, high wages and rents, as well as the retail downturn led to the company's decline. A city has fallen from the sky. 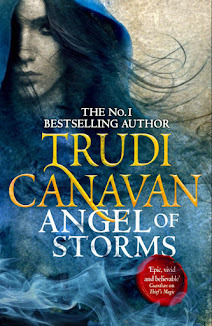 In the wreckage, two men – Devian Lell, a window cleaner in the floating cities of Loft, and Eli Kurran, a security guard in one of the polluted, ground-based cities of Dirt – will find their lives changed. Devian, who has done what few in the floating landscape have by stepping outside the sanctuary of his home, will be drawn into the politics of Loft, as he is recruited to be the assistant for Dirt’s political representative. On the ground, Kurran, still mourning the death of his wife, tries to remove himself from the violent politics of Dirt even as he is blackmailed into providing security for the diplomatic representative of Loft, a woman three times his age, and the oldest living person he has ever met. 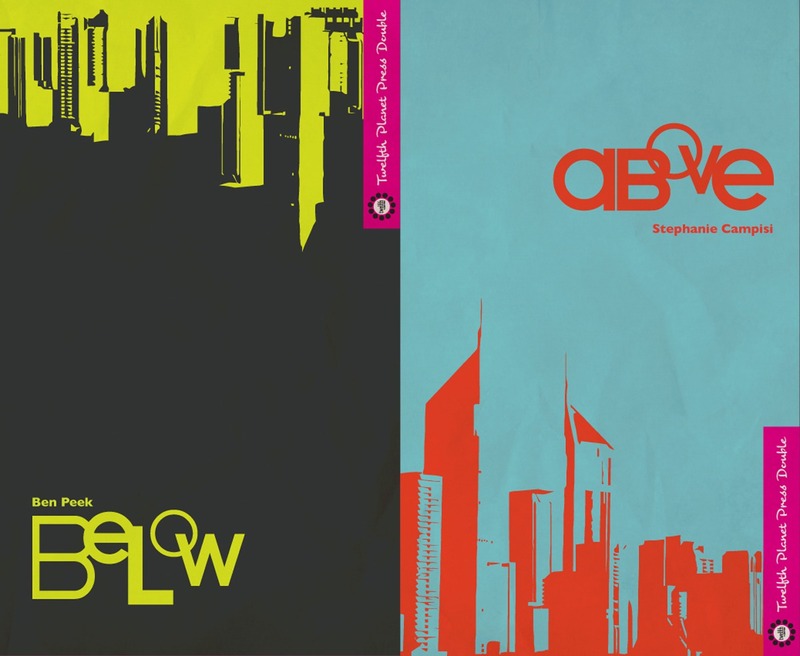 A tale of two cities, the stories Above and Below make up two halves of another in the TPP Doubles series. Written by Stephanie Campisi and Ben Peek, designed to be self-contained and complete as individual narratives, the two parts can be read in either order, yet also form a single narrative that has been intricately woven and designed to create a single, novel length story. It is a work that suggests not a single way of reading, but rather two, with conflicting morals that will continue to test the reader’s certainty in who, in the cities of Loft and Dirt, is in the right. The Company Articles of Edward Teach – Learning to live inside your own skin is hard enough, but what if you were thrown back in time, to another body; a different world…? I was dead and now I’m alive, a stolen soul from a different world, but there seems to be another mind sharing the body with me and I really don’t want to go mad. The body of Blackbeard the pirate surfaces beside me, bleeding, and I want to laugh. I’ve been sent back three centuries. The clash between my two sets of memories makes me want to throw up. All the safety I took for granted is gone. Reports had come in as the revolution erupted: a myriad of rotating discs approached Earth at speed. Panic and joy spread around the planet in viral waves. Few needed any help to identify these flying objects. They were the angælic vehicles. And at the helm of the lead saucer was the Man himself. Jesus Christ. Nightsiders by Sue Isle is the first cab off the rank so to speak in the Twelve Planets collection of books from Twelfth Planet Press. 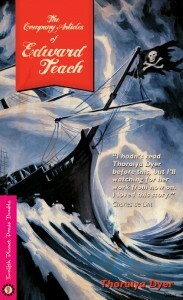 The Twelve Planets are twelve boutique collections by some of Australia’s finest female short story writers. Each collection will offer four short stories with a unique glimpse into worlds fashioned by some of our favourite storytellers. Some linked stories,others are tasters or samples of the range and style of the writer. Regular readers may have noticed that I support TPP rather vigorously, personally I thinks it's justified, everything I have bought from them has been top quality, no matter the sub-genre. But for those of you who are skeptical and require more than my subjective opinion, please note that Sprawl, an Urban Fantasy anthology and stories from it pepper the Locus recommended reading list - see here. When I was growing up, access to comics was never easy. I lived in Alice Springs and it was a more remote place than it is now. My comic collecting was at the whim of local newsagents, who would often get dribs and drabs of the more popular titles in, sometimes even neatly in sequence. As I got older the one of the franchise book stores in town was able to get dribs and drabs of the bound and collected series, but these were for the most part expensive $40+ tomes and from memory it was an expensive experiment for the book store too. It seems though that at least the difficulty in distribution might have been solved according to an email I received recently. 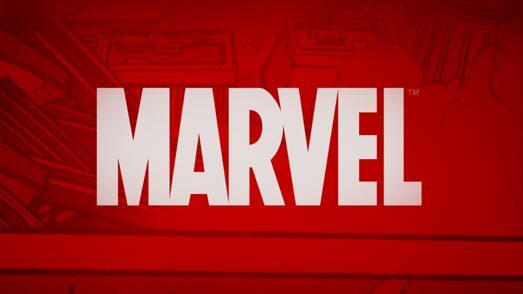 Apparently Diamond who distribute comics to specialist stores will also be supplying book stores with Marvel titles. What's also interesting to note is that there are three Marvel movies coming out this year with their associated tie-ins Thor, X Men and Captain America. 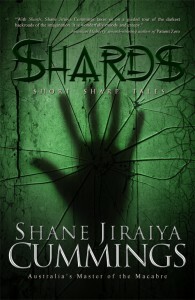 Shards by Shane Jiraiya Cummings is as its subheading spells out; a collection of short, sharp, tales. A collection of polished Flash fiction, it leaves the reader with poignant imagery and as horror, a lingering sense of unease. Bad flash can be like a half rendered idea, an unfinished thought -thankfully Shards is a collection of carefully crafted work that leaves you with a sense of foreboding, or wishing you hadn't just eaten. Like any collection there are things the reader will prefer dependent on their own tastes and experience. While there were pieces that didn't grab me as a reader, there was nothing in the collection that felt to me as if it were padding. There is a sense here that Shards is a bit of a showcase of what Cummings is capable of as a horror writer. While all tinged with the macabre there is breadth and depth in its offerings. We have the delicious and darkly humorous Smoldering Eyes at only 5 lines long, the witty Revision is Murder and the rather grotesque Itch. Post Card from Paris (a reply) - again because the story skirts the edge of plausibility - this horrifying situation could happen. Congo Jenga - almost for its title alone, as an excellent metaphor for the tale it names. This tale riffs nicely of the dangers of traveling the dark continent and the punishment that awaits those with dark desires. A reader might be forgiven for thinking that writing flash is easy because it's short, I think like poetry though, writing good flash, polished flash is a skill that requires practice. And Shards is the collection of a well practiced horror writer. Shards is available through Amazon Kindle , Smashwords or in print form from Brimstone Press. It contains 33 macabre and monstrous tales of varying length. Note: this book was provided by the author at no cost to myself. If you follow me on twitter you may have come across The Bookbloggers Daily that I collate and publish through the paper.li service. Essentially I add people to a twitter list - in this case it's my "book bloggers" list and then the paper.li service collates all the public tweeted links these people make into a webpage format. I find this useful for me as I try to keep tabs on trends in Publishing, Author comings and goings and what my fellow book bloggers are promoting. Can I get on the list? You can leave your twitter contact details in the comments below or follow me and message me via twitter. Or if you just want to subscribe to the list itself and don't want to participate, then you can click here to subscribe. I have decided to keep my library loot to a minimum this week as the books are beginning to build up. I have also gone with another heavily illustrated novel despite the likelihood that it won’t display well on my reader or my laptop. I was listening to the Coode Street Podcast where they were discussing Australian author, artist and film maker, Shaun Tan. Tan has received an Oscar nomination for his adaptation of The Lost Thing. A book that he wrote and illustrated. Unfortunately I was unable to find a eBook version of The Lost Thing or The Arrival , another of Shaun's works I have heard good things about. The stories are quirky and I am reminded in some ways of Michael Leunig, both he and Tan have ways of directing you to look at the ordinary from a different perspective. Tan's artwork is magnificent even reading it on adobe digital editions. Am I about the last person to discover Shaun Tan's work? What other visual story tellers am I missing out on? and this short of Michael Caine reading from his autobiography is just some of the media that's available. Hachette also informs me the Jeff Lindsay , author of the Dexter series of books that inspired the hit TV show will be touring Australia in February and March of this year. This weeks loot nearly didn’t happen owing to my birthday celebrations and subsequent traveling all over the countryside and my library deciding to do an upgrade that kept me unable to log in to checkout titles I had on hold. Thankfully though all was not lost. 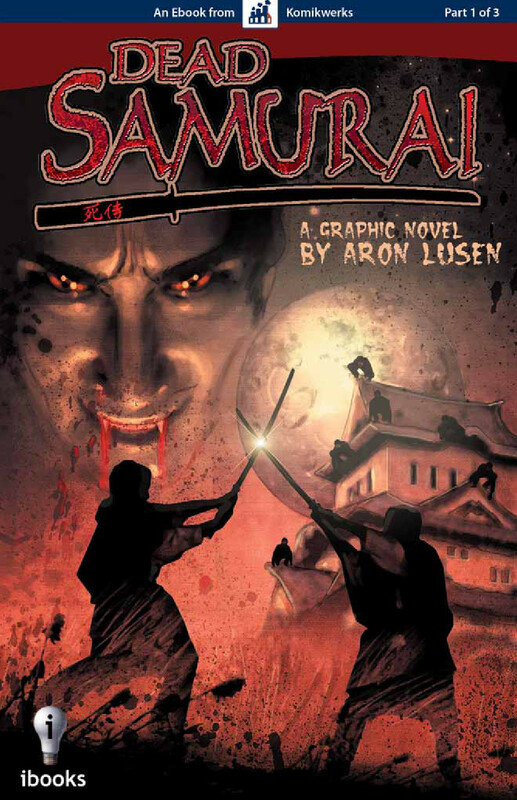 I was able to get in eventually and this week I decided to experiment a little by borrowing a graphic novel. I wanted to see how well my Sony PRS 505 handled it. Dead Samurai by Aron Lusen is a graphic novel obviously set in Japan, my recent reading of Shane Jiraiya Cummings' The Smoke Dragon had me in the mood for another visist to pseudo historical Japan. The bodies of local samurai are found mutilated in the fields, and no one knows who is responsible. Reluctant to become involved, Kyuzomo is conflicted by his duty to defend and his deep desire to re-forge a life and love that he once had. Kyuzomo is a man without a memory. Long presumed dead, and wanted for murder, Kyuzomo wanders home after a mysterious eleven year absence, only to find his former life in shambles and his village in the grip of fear. With the specter of his dark history looming, Kyuzomo must fight to destroy an evil menace that is ravaging a village he once called home and piece together the mystery of his missing years. Not well, at least on my reader. The format is pdf and enlarging the pictures so that I could read the dialogue made it an arduous process. I ended up reading it on my laptop and even then it required enlargement and fiddling. It would be interesting to know how it performs on colour readers like the iPad. Even then I suspect that I would prefer to read/view graphic novels in paper form. I think the artwork and hence your appreciation of it suffers in the digital form.